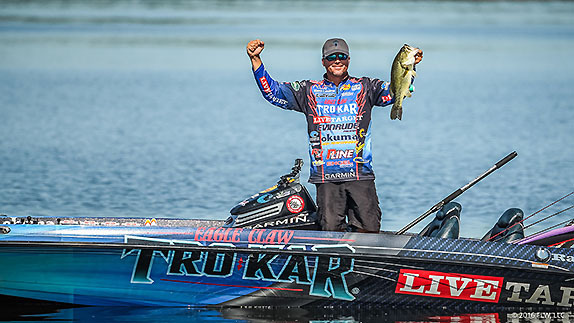 Scott Martin's victory at Lake Champlain was his sixth on the FLW Tour and third at that venue. 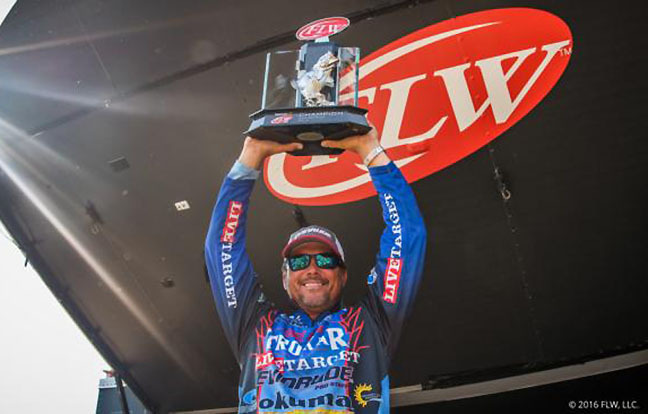 Scott Martin has developed a habit of ending FLW Tour seasons with a flourish. 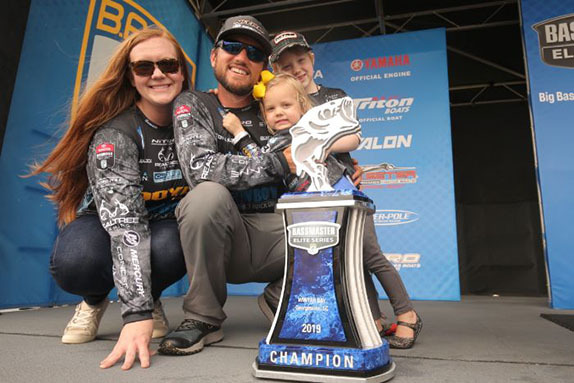 Last year, the Floridian wrapped up his first Angler of the Year Title with a 6th-place finish in the finale at the Potomac River. 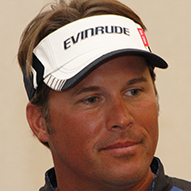 This year he notched his record-setting sixth career victory and third at Lake Champlain, becoming the first Tour competitor to prevail three times at the same venue. He led this one from start to finish after boxing a tournament-best 22-05 on day 1. 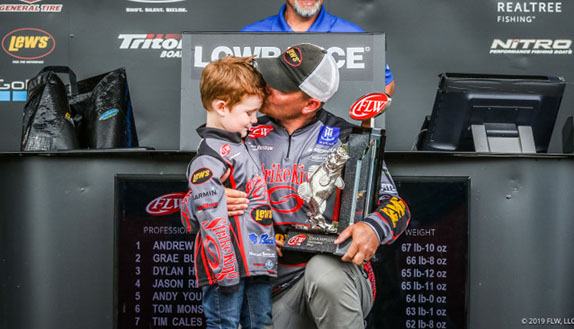 He doubted that his 16-pound stringer on the final day would be enough to keep him at the top, but his 74-10 total left him a pound clear of runner-up Jason Meninger. His son Reed turned 16 on Sunday, so he had extra incentive to finish what he started. He mentioned on stage that a portion of his $125,000 check might go toward buying the kid a car. Following are some of the details of how Martin dominated a venue that, despite its lack of proximity to his residence in the Sunshine State on the shores of Lake Okeechobee, has become a home lake away from home. Although the 3-day practice period was windy, competitors had no trouble recognizing the potential for catching smallmouths from the spawning beds. Brown fish participating in the reproduction process could be easily seen anytime the surface disturbance was reduced to a mild chop. 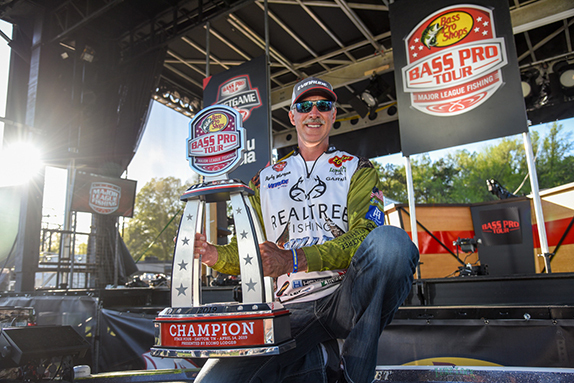 Tour-level events at Champlain are never won strictly with bronzebacks, though, and Martin knew he needed a largemouth program that would produce some kickers. With the water about 3 feet below full pool, he located some of those on scattered cover (mostly rock, but also some grass and wood) adjacent to the banks in massive Missisquoi Bay on the lake's northern end. "We had really good weather for looking on the last day of practice, but I didn't really find a lot of big ones," he said. "I only found a handful of spawning fish that were over 3 pounds. "I knew I'd have to stretch the largemouth bite a lot further because I didn't have a lot of smallmouth to fall back on. I really wanted to use the smallmouth for filler-fish when I needed them." Martin's plan for day 1 was to try to catch a couple of big largemouths right away and he picked up a 5-pounder on a crankbait at his initial stop. A jig produced a similar fish a couple hours later, and then another one around lunchtime. "I started thinking that I was two more good largemouth bites away from a big bag and I wanted to save the smallmouths anyway, so I stayed with that," he said. "I ended up catching another almost-5-pounder late in the day and one other good one." Holding a lead of a little over a pound when day 2 started, he went with the same game plan, but it wasn't quite as productive. "They weren't biting as good that day. I caught one pretty good one in the morning and then moved up on some wood and caught another good largemouth. "I (eventually) got up around 16 pounds, but I had a couple of 2 1/2-pounders that I wanted to get rid of. The largemouth stopped biting at around 12 o'clock, so I went to a place where I had a couple of 3 3/4-pound smallmouths on beds to try to get up to 18 or 19." He caught both of those, then spotted a 4 1/4 nearby and hoisted it into his boat as well. "That gave me 20, so I spent the rest of the day looking around. I found the ones I had marked and a handful of new ones. I thought there was another 16- to 17-pound bag there and I was hoping to not have to use them until day 4. Scott Martin caught quite a few smallmouths at Lake Champlain, but hefty largemouths from Missisquoi Bay were the key to his victory. His advantage was a little more than 2 1/2 pounds to begin day 3, but that round started inauspiciously for him. He suffered a mechanical issue shortly after he arrived in Missisquoi and had to trek back to the launch in Plattsburgh, N.Y. to swap out boats. "It was too far to run all the way back up there, so I decided to use my smallmouth as a survival bag," he said. "I caught close to what I thought I had there (his weight would've been 16-09 that day, but he incurred a 4-ounce dead-fish penalty) and then I went back to the largemouth water later in the afternoon. "I had about an hour to try to get one big bite, but it was just kind of dead. Looking back, it was a really good day to go and get those smallmouth." He still led by more than 2 pounds once the weigh-in was complete and the field had been reduced to the Top 10, but he was certain he'd need a bigger stringer on the final day. Meninger and Bryan Schmitt were catching stout bags of largemouths from the Ticonderoga area at the other end of the lake and he anticipated at least one of them coming back with 20 pounds on Sunday. He figured he'd need to return with at least 18 pounds to close out the victory. "I caught a lot of 3 1/4s and 3 1/2s on day 4, but I couldn't get that 4- to 5-pound bite I'd been getting every day. I lost one fish that looked like about a 4, but other than that I fished clean." He started out by popping a couple of 3-pound-plus bed-fish from near the take-off ramp and said that relieved a bit of the pressure he'd begun to feel. An isolated patch of grass on the way to Missisquoi surrendered a 3-pound largemouth. He added a couple of smaller keepers shortly after arriving at his main area, then added a 3 1/2 at 10:30. "That gave me probably 14 1/2 pounds and I knew that wouldn't be enough. I made a run up a creek and caught another 3 1/2 off a piece of submerged timber I'd found the day before. "After that I ran through my rotation all the way back to the ramp and made a few 1- or 2-ounce culls. They weren't much, but they kept the momentum and the enthusiasm going. I was still looking for that 4- to 5-pound bite, but I never got it." As it turned out, he didn't need it." The largemouths, which Martin caught on a combination of the crankbait, the jig and a finesse worm, were hanging out in 2 to 6 feet of water. "It was pretty straight-up fishing," he said. "The real key to it was timing. "They were post-spawn fish and I think they were set up there for the duration of the summer. It wasn't overrun with pressure this time because it wasn't that loaded � you had to pick it apart to get the bonus bites. I wasn't catching them like gangbusters � I was getting probably 10 to 12 bites a day." The super-aggressive bedding smallmouth could be enticed with just about anything � eventual 4th-place finisher David Dudley even suggested cutting up pieces of a banana peel and using them as baits just to disprove the old superstition that the fruit is bad luck to have on a boat when trying to catch fish. > Cranking gear: 7'11" medium-heavy Okuma Scott Martin Tournament Series Power Crank rod, Okuma Helios casting reel (7.3:1 ratio), 12-pound P-Line fluorocarbon line, LiveTarget Threadfin Shad (metallic pearl/blue shad). > Jig gear: 7'6" Okuma Scott Martin Tournament Series Flipping/Jig rod, same reel (8:1 ratio), 17-pound P-Line fluorocarbon, 1/2-ounce M-Pack Lures Flipping Jig (green-pumpkin, skirt trimmed), 4" Tightlines UV Jig Trailer (green-pumpkin). > Worm gear: 7' medium-heavy Okuma Scott Martin Tournament Series APC rod, same reel (7.3:1 ratio), 12-pound P-Line fluorocarbon, 1/4-ounce jighead, Tightlines UV Finesse Worm (green-pumpkin). > He also used an unnamed white crawfish imitation on his worm rig. > Main factor in his success � "I made some really good decisions about where to go and when to leave and that kind of stuff." > Performance edge � "My Garmin Panoptix allowed me to stay off the submerged vegetation and rocks and see exactly where I needed to cast every time � every cast I made I considered to be in the strike zone and it helped me catch a bunch of extra fish. The other thing was the 10-foot Power-Poles; I could pole down in 7, 8 or 9 feet of water and pick apart the grass beds very quietly." Father (Roland Martin) - "Because of his determination and energy on the water. I always call him 'the machine.' He just keeps going and never gives up." Lake Okeechobee (FL) - "It's 12 months a year of the best bass fishing in the country." Red River (LA) - "I've been there twice and I get killed. There's too many trees in the water." "I really enjoy being versatile." "I like to spend time with my family as much as possible."